Easily said, Hindi films are generally made up of lots of coincidences and this film is no exception. This is one movie where the female lead is not just used to provide sexual and love interest but Zeenat Aman gets plenty of footage with her martial arts and action scenes. 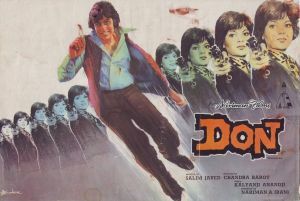 When ruthless Don (Amitabh Bachchan) is killed by the police, the DSP (Iftekhar) is afraid that another “Don” will take over when the rest of the gang come of know of his death, so he, unbeknown to the rest of the police force, recruits Don’s look-alike Vijay (also Amitabh Bachchan) to become the real Don. Vijay is, at first reluctant, but when promised that two children he is caring for, will be looked after and educated, he agrees. He is successfully re-located back with his gang by feigning injuries, and loss of memory. He soon recuperates. Then fate takes an unexpected turn when the DSP is killed and Vijay becomes the suspect; his role as the Don ends, as his gang comes to know he is a fraud; Vijay must run for his life – both from the police and Don’s gang – for his life, and the life of the two children.